The spread of vibrant social diversity is constricting the GOP’s ability to champion conservative causes, such as smaller government and independent families, President Barack Obama said in a softball media interview. “Over the long term, I’m pretty optimistic, and the reason is because this country just becomes more and more of a hodgepodge of folks,” Obama told Vox editor Ezra Klein. “People are getting more and more comfortable with the diversity of this country, much more sophisticated about both the cultural differences but more importantly, the basic commonality that we have,” he said in his talk, which was recorded Jan 23. But for Obama, “commonality” is a go-to euphemism for big, intrusive, nation-wide government by progressive experts. The nation’s governors “all have a common interest, and that is making sure that their constituents — who are also my constituents — are able to gain opportunity, work hard, prosper, feel secure,” Obama said in a Dec. 5 comment about visiting governors. “That happens best when we work together, whether we’re talking about Democrats and Republicans and independents working together, or whether we’re talking about state, federal and local officials working together,” he said. “What our country needs from us right now is a common purpose –- a higher purpose,” he said Nov. 20 when he announced his unpopular Oval Office amnesty for eight million foreign migrants working illegally in the United States. “Our history and the facts show that immigrants are a net plus for our economy and our society,” he insisted, even though wages have remained stalled since immigration rose after 1965. Free-market variety is contrary to a common purpose, Obama said Jan. 21. “Our media is all segmented now so that instead of just watching three stations, we got 600,” he said in an Idaho speech. “You got the [single] conservative station and the liberal stations. So everybody is only listening to what they already agree with. And then you’ve got political gerrymandering… so there are a lot of institutional forces that make it seem like we have nothing in common,” he said. 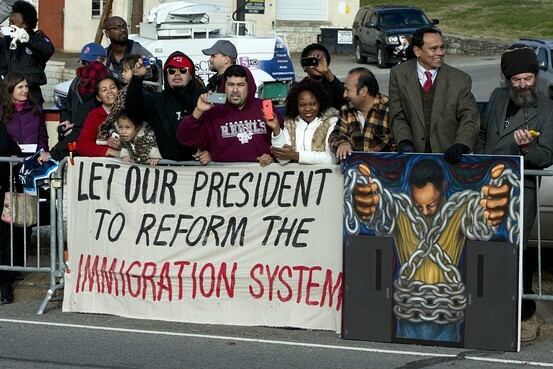 This is hope and change, flooding the nation with immigrants that have no means of support other than government. People that will vote themselves benefits if given the chance. America will become a nation of poor immigrants if we allow Obama to continue his destruction of the country, You can see it, You can feel it and Your going to pay for it with your childrens futures.